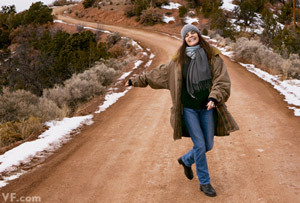 The Trail of Painted Ponies was honored when acclaimed actress and animal rights activist Ali MacGraw, generously volunteered her time and talents to The Trail. 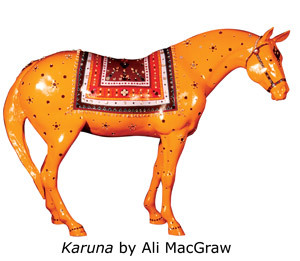 Ali created a stunning Painted Pony titled, "Karuna," which is a Buddhist term, referring to the concept of compassion, and translates "any action that is taken to diminish the suffering of others." Her Painted Pony was crafted into a figurine in 2003 and today, it continues to be a prized collectible. Ali MacGraw also graciously shared her star power with the world when she narrated the award-winning documentary film about The Trail of Painted Ponies. The first "celebrity" to create a Painted Pony was Ali MacGraw, best known for her iconic turn as the college student in the movie "Love Story," for which she won a Golden Globe and an Academy Award nomination. Ali's career and life would keep her the spotlight for the next twenty years, during which she starred in other films, married actor Steve McQueen, was voted by People Magazine as one of the "50 Most Beautiful People in the World," and was feature d in the prime-time soap opera Dynasty. Then she fled what she would later describe as "the insanity of stardom," and moved to a getaway house in the hills north of Santa Fe, New Mexico. Known as a place where people could reinvent themselves and lead a healthy lifestyle, Ali did just that. She took up yoga, producing a yoga video that became a bestseller. She became heavily involved in community-based activities, most notably as an animal rights activist. "I've always loved animals and I always thought that they were, if not better, then the absolute equal of any two-legged creatures that God ever created." Generously and graciously Ali donated her time to worthy causes... and when invited to paint a life-size Pony that would allow her to express herself creatively in a different way, and at the same time would benefit the Santa Fe Animal Shelter, she picked up a paintbrush and created "Karuna." A Buddhist term, it refers to the concept of compassion, and translates "any action that is taken to diminish the suffering of others." 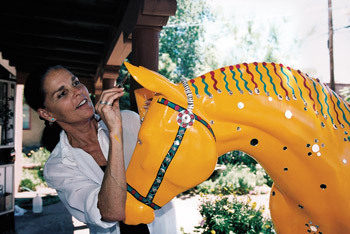 We would like to thank Ali MacGraw for being such an important part of The Trail of Painted Ponies and for all of her work on behalf of animals in need. A thousand "Thank You's," Ms. MacGraw. Ali MacGraw gave America a new kind of heroine, married two movie legends - producer Robert Evans and Steve McQueen, her co-star in The Getaway - then skipped out on Hollywood almost as abruptly as she'd conquered it. Four decades and a few heartbreaks after the release of Love Story, MacGraw tells the author about the life and loves of an old-fashioned, hardworking Wellesley girl, whose beauty made her a style icon, but whose dreams were never about fame. To read the entire article from Vanity Fair, Click Here.